אֵיזֶהוּ לֶקֶט? זֶה הַנּוֹשֵׁר בִּשְׁעַת קּצִירה וּבִשְׁעַת תְּלִישָׁה. רבי יוֹסֶי אוֹמֵר אֵין לֶקֶט אֶלָּא הַנּוֹשֵׁר בִּשְׁעַת קְּצִירָה בִּלְבָד שֶׁנֶּאמר (ויקרא יט:ט, כג:כב) וְלֶקֶט קְצִירְךָ לֹא תְלַקֵּט. Mishna Peah 4:10 defines in anonymous statement that Leket is something that is left over in the field as a result of harvesting. Our Tosefta clarifies that the statement in the Mishna is really the opinion of Rebbi Yossi, but there is another opinion which includes also the produce that was left in the field is a result of handpicking.It was already mentioned above in Tosefta Peah 1:14 that the obligation of all of the gifts to the poor depends on the manner of harvesting the produce and if the farmer harvested them in an abnormal manner then the produce is exempt from all of the gifts to the poor. In the case of grain in order for it to be obligated in the gifts to the poor it has to be reaped with a tool and not plucked out of the ground by hand. Our Tosefta does not mention whether it is specifically talking about grain that is normally reaped or if it is also talking about other types of produce, such as beans, which are also obligated in Leket (see note 6 below), but are normally picked by hand. If we would assume that our Tosefta is only talking about grain then the opinion of the Tanna Kama would be in contradiction with Tosefta Peah 1:14, which said that grain which was plucked by hand is exempt from Leket, because that is not the normal manner in which it should be harvested. Only the opinion of Rebbi Yossi would be in agreement with that Tosefta. However if we were to assume that this Tosefta is not specifically referring to grain, but to all produce which is obligated in Leket, including things that are normally picked by hand, then it is possible to explain it in a way that both the Tanna Kama and Rebbi Yossi agree with the Tosefta Peah 1:14 and their argument has nothing to do with the normal manner of harvesting, but rather with the derivation from the verse mentioned in this Tosefta and if it should be taken literally or not. According to this explanation, both of them agree that if produce was not harvested in the normal manner, such as if grain was plucked out of the ground by hand, then it is exempt from all of the gifts to the poor. However they argue whether produce that is normally picked by hand is obligated in Leket or not. The Tanna Kama holds that it is, but Rebbi Yossi holds that only produce that is harvested with a tool, such as grain, is obligated in Leket, but not produce that is normally picked by hand, such as fruit or beans. Since the verse which Rebbi Yossi mentions and learns literally is only talking about Leket then their argument is only applicable to Leket and not to other gifts to the poor.I have chosen to explain this Tosefta according to the last explanation in order to prevent the possible contradiction. I would like to immediately point out that it is not the way it is explained by many commentators, such as Minchat Yitzchak and Chazon Yechezkel, who explain it based on the way Talmud Bavli (Chulin 137a) explains a similar Beraita. Talmud Bavli’s explanation of that Beraita cannot be applied to this Tosefta, because that Beraita is radically different in its wording and opinions from this Tosefta as was already pointed out by Higayon Aryeh and Tosefta Kifshuta. For a description of what Leket is see above Tosefta Peah 1:13, note 5. Although generally the Hebrew word קצירה (Ketzira) is translated as “harvesting”, it literally means “reaping”. 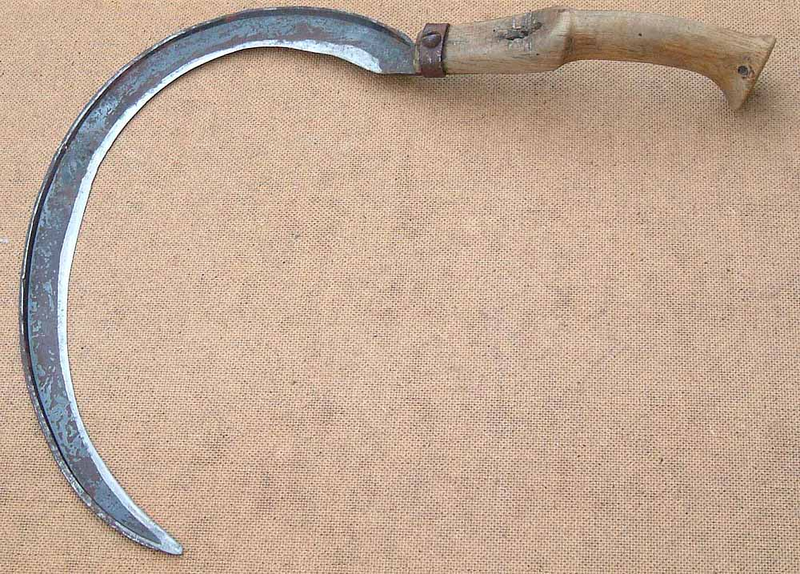 Reaping is the step of the actual harvesting where the stocks of grain are cutoff using a tool, such as scythe or a sickle. The normal process of reaping grain is only done using such a tool. The Tosefta at this point is specifically referring to reaping with a tool. Detachment refers to harvesting any produce by hand by ripping it off the stalk. As I already explained above in note 1, the Tanna Kama holds that when the Torah says וְלֶקֶט קְצִירְךָ (literally: the fallen [stalks] of your reaping), it means “the fallen stalks of your harvest”. The word קְצִירְךָ (Ketzircha) here means “your harvest” in a general sense without a specific reference to the reaping of grain, and therefore it includes in the commandment of Leket produce that is normally picked by hand, as well. Rebbi Yossi chooses to translate the word קְצִירְךָ (Ketzircha) as “your reaping”, as opposed to “your harvest”, and therefore the verse is only referring to produce which reaped, such as grain. According to him any produce that is not normally reaped would be exempt from Leket. My whole explanation of this Tosefta was built on the assumption that other produce, besides grain is obligated in Leket. The problem with this assumption is that there is no explicit source for it from Talmudic literature. It was already mentioned above in Tosefta Peah 2:13 that Leket applies to grain, but does not apply to fruit. However the Tosefta left open the question whether Leket applies to other things, which are not fruit and are not grain, such as legumes and vegetables. From the Rishonim (medieval authorities) it is implied that Leket applies to legumes as well. For example, see Sefer Hachinuch 218, Smag (Lo Taaseh 284), and the Mishneh Torah of the Rambam (Hilchot Matnot Aniyim 4:2) where he explicitly says that Leket applies to other types of produce besides grain which are normally picked by hand. Aruch Hashulchan Haatid (Hilchot Peah 1:7) discusses this issue and concludes that it is basically an assumption of all of the early and late authorities based on scriptural references, but there is no explicit Talmudic source that clearly states that Leket applies to anything else besides grain. He mentions that Sifra (Kedoshim, Parshitta 1, Perek 1) states that legumes are compared to grain and therefore should have the same law apply to them with regard to all gifts to the poor, however a careful analysis of the Sifra shows that it is only talking about Peah and not about Leket. Some commentators (see Ohr Pnei Melech on the Mishneh Torah of the Rambam (Hilchot Matnot Aniyim 4:2) and Smag (Lo Taaseh 284)) suggest that the source for this law is Mishna Peah 4:10, which is talking about Leket and says that if a person “picked by hand”, which they say is not referring to grain, but rather to another type of produce which is normally picked by hand. This suggestions is however very difficult to accept, because the Mishna itself says that if a person picked it by hand then it is not Leket and still belongs to the owner, implying that it is talking about grain and the reason that it is not Leket, because it was not harvested in the normal manner of harvesting grain. Unfortunately, I was not able to come up with a solid source for this law and therefore I admit that my whole explanation of this Tosefta hangs by a thread and could be easily refuted. Since the previous Tosefta mentioned the concept of confiscation of gifts to the poor and also mentioned gifts given to Kohanim and Leviim, it states a new law regarding the confiscation of these gifts. It is not related to any Mishna. For an explanation of various types of gifts that are discussed in this Tosefta see notes 16 and 17 on the previous Tosefta. “We” is meant here as the big we referring to the Bet Din (court) who would enforce this law. A Kohen is obligated to give all of the priestly gifts just like a regular Jew, meaning that he must separate them from the regular produce and treat them in the same manner as all of the gifts are normally treated, such as that Terumah becomes holy and has to be eaten in a state of purity. However, in some cases the Kohen is allowed to keep these priestly gifts for himself instead of giving them to another Kohen. For example, if the Kohen buys produce from a farmer before the produce has been piled, meaning that it did not become obligated yet in Terumot and Maaserot, he is allowed to keep the Terumah for himself and not give it to another Kohen. See Mishna Peah 1:6. He still has to give Maaser Rishon to the Levi, since that gift was not meant for the Kohanim at all. However, if the produce was already piled by the farmer and then the Kohen bought it, since the produce already became obligated in Terumot and Maaserot the Kohen is not allowed to keep the Terumah for himself, but rather has to give it to another Kohen. Talmud Yerushalmi (Peah 1:5, Daf 9b) explains that really this law is a special Rabbinical enactment and not a Torah law. By Torah law the Kohen is allowed to keep the Terumah for himself after he separates it and the Levi is allowed to keep Maaser Rishon after he separates it. However, the Rabbis enacted a special fine for the Kohanim and Leviim and prohibited them from keeping the Terumah and Maaser Rishon, respectively, after the produce has become obligated in them. The reason they enacted such a fine is because they did not want the Kohanim and the Leviim buying all of the produce directly from farmers as Tevel (untithed produce), which obviously had the same price as tithed produce (i.e. the farmer did not charge for the percentage that had to be given away as a tithe) and then keeping the Terumah and Maaser Rishon for themselves, thus making on it a huge profit in comparison to regular Jews who paid the same amount of money for this produce, but had to give a significant portion of it away to Kohanim and Leviim. Our Tosefta discusses a case where the Kohen or the Levi decided to pocket the Terumah or Maaser Rishon for themselves, respectively, despite this Rabbinical enactment which required them to give it away. The Tosefta says that since by Torah law they are allowed to keep it for themselves, in the case where they did not follow the Rabbinical enactment the court does not force them to give it to another Kohen or Levi, but rather allows them to keep it. The reason for this would be that the Rabbis did not want to enforce their enactment to such an extreme that would require confrontation between the Kohanim, Leviim and the courts. They reasoned that since most Kohanim and Leviim would comply with the new law it would be sufficient to provide a fair market for the Israelite (Yisraelim) farmers who had to give away these gifts to the Kohanim and Leviim. From the statement in Talmud Yerushalmi which specifically refers to produce it can be implied that this Rabbinical enactment was only enacted for the gifts that apply to produce such as Terumah and Maaser Rishon, but not to other gifts, which come from animals, such as Reishit Hagez (first sheared wool) and the three Matanot (gifts), the foreleg, the cheeks and the forth stomach, all of which the Kohen would be allowed to keep for himself even by Rabbinical law. I do admit that it is not clear and therefore it is possible that this Rabbinical enactment applies to all gifts and not just the ones from produce. Talmud Bavli (Chulin 131b) has a different spin on this law based on a Beraita that it quotes similar to our Tosefta, which combines the text from the previous Tosefta and this Tosefta into a single statement, and specifically says that this law is talking about the three animal Matanot, that if they are kept by the Kohen for himself we do not confiscate them from him to give to another Kohen. Obviously according to that Beraita it is implied that the Torah somehow demands that these gifts need to be given to another person and not just kept by the owner, even if he is entitled to getting them himself, since there is no Rabbinical decree regarding the animal priestly gifts. However I do not think that our Tosefta is of the same opinion and therefore I have explained it based on the Yerushalmi that I quoted. Obviously if the Levi decided to also pocket one of the priestly gifts that have to be given to a Kohen, such as Terumah or Terumat Maaser the court forces the Levi to give them away, since even by Torah law he is not allowed to keep them, but rather has to give them to a Kohen.It should be noted that Ezra passed a decree in which he punished the Leviim for not returning to the Land of Israel with him and instead staying in Babylon, by taking away their gift of Maaser Rishon and giving it to the Kohanim instead. See Talmud Bavli (Yevamot 86b) and Rashi (Chulin 131b, Dekansinhu Ezra) for historical sources of this enactment. It is not clear if the law of this Tosefta would also apply to a Levi who decided to keep the Maaser Rishon for himself according to Torah law instead of giving it to a Kohen in violation of Ezra’s decree. Talmud Bavli (Chulin 131b) discusses this issue, however the discussion is based on a lot of different material and it is not really possible to tell from it what would be the opinion of this Tosefta. I would like to suggest that since Ezra’s decree is obviously Rabbinical and our Tosefta already voiced that we do not force a Kohen or a Levi to give up their gift due to a Rabbinical decree it would agree that we do not force a Levi to give up his Maaser Rishon to the Kohen, but rather let him keep it in accordance with the Torah law. Finally, there is an argument in two Beraitot between three Tannaim, Rebbi Akiva, Rebbi Meir and Rebbi Elazar Ben Azaryah, whether the Levite gift, Maaser Rishon, can also be given to a Kohen by Torah law, since the Torah calls Kohanim, “Leviim”, on many occasions. See Talmud Bavli (Yevamot 86a-b). Rebbi Akiva and Rebbi Meir hold that Maaser Rishon can only be given to a Levi and not a Kohen, but Rebbi Elazar Ben Azaryah holds that it can be even given to a Kohen. These Beraitot are only quoted by Talmud Bavli and do not appear in the Tosefta or Talmud Yerushalmi, which may suggest that they were taught only in Babylonian schools. We do not know which opinion our Tosefta holds like although it is most probable that it holds that Maaser Rishon can only be given to a Levi and not a Kohen, since that is the prevalent opinion throughout Talmudic literature and the Tosefta was not even aware of the argument on this subject, since it was not taught in schools of the Land of Israel. Either way, the rule of the Tosefta whether Maaser Rishon can be taken away from a Kohen would depend on this argument, since it can only be taken away if it belongs exclusively to the Levi by Torah law. I would like to point out that some commentators on the Tosefta explain this Tosefta in the same way that the Talmud Bavli (Chulin 131b) explains a set of similar Beraitot that it quotes. For example, see Chasdei David and Minchat Bikkurim on this Tosefta. According to that explanation the Tosefta is specifically talking about the gift of Reishit Hagez and not other gifts as the Gemara (ibid.) concludes. Without going into too much detail I do not think that that explanation in the Tosefta is correct, because the Gemara (ibid.) is not quoting our Tosefta but rather a different Beraita. Also the Gemara forces all kinds of cases on that Beraita in order to avoid various questions on it. This Tosefta does not have to conform to the Gemara’s interpretation and can be explained in a much more generic fashion, as I have done above. ארבע מתנות בכרם: הפרט, והשיכחה, והפיאה, והעולילות. ושלש בתבואה: הלקט, והשיכחה, והפיאה. ושתים באילן: השיכחה, והפאה. כל אילו אין בהן משום טובה, אפילו עני שבישראל מוציא את שלו מידו. מעשר עני אין בה משום טובה, אפילו עני שבישראל מוציא את שלו מתחת ידו. מתנות כהונה ולויה כגון הזרוע, והלחיים, והקיבה יש בהן משום טובה, ונותן לכל כהן שירצה. The first part of the Tosefta outlines all of the different gifts to the poor as they apply to different types of crops. It is not related to any Mishna. The second part of the Tosefta regarding favoritism is related to Mishna Peah 4:9 which quotes an argument between Rebbi Eliezer and the Chachamim (Sages) regarding if the owner of the field is able to set aside Peah for a particular poor person or if he must give it to the first poor person who comes to him. This Tosefta expands on that case and follows the opinion of the Chachamim who hold that Peah must be given to the first poor person who comes to collect it. For the definition and explanation of Peret see above Tosefta Peah 1:13, note 5. The Torah explicitly states that Peret applies only in a vineyard. See Vayikra 19:10. For the definition and explanation of Shikcha see above Tosefta Peah 1:13, note 6. Since a grapevine is a tree Shikcha applies to it in the same way as it applies to all fruit trees. For the details of how Shikcha is defined by trees see note 9 below. Talmud Bavli (Chulin 131a) states that Shikcha by a grapevine is learned out from an extra word אַחֲרֶיךָ, “after yourself”, in the verse in the Torah by Olelot (Devarim 24:21), however that seems to be a superfluous derivation, since Peah equally applies to all trees, as the Tosefta states. Since a grapevine is a tree Peah applies to it in the same way as it applies to all fruit trees. For the details of how Peah is defined by trees see note 10 below. Talmud Bavli (Chulin 131a) states that Peah by a grapevine is learned out from a Gezeira Shavah (Derivation by Equal Decree) from the word אַחֲרֶיךָ, “after yourself”, between the verses of olives (Devarim 24:20) and grapes (Devarim 24:21). However, that seems to be a superfluous derivation, since Peah equally applies to all trees, as the Tosefta states. See Tosafot (Chulin 131a, Gamar) who points out that this particular Gezeira Shavah seems to be very problematic for various reasons. For a description of how a Gezeira Shavah works in general see Tosefta Berachot 6:2, note 5. For the definition and explanation of Olelot see above Tosefta Peah 1:13, note 7. The Torah explicitly states that Olelot apply only in a vineyard. See Vayikra 19:10 and Devarim 24:21. To an untrained eye, or someone reading the translation of the Torah and not the original, it does not seem to explicitly state that Leket applies only to grain. See Vayikra 19:9 and 23:22. All the Torah there says is וְלֶקֶט קְצִירְךָ לֹא תְלַקֵּט, “and the fallen [stalks] of your harvest you should not pick up”. However, the Hebrew word קציר, (Ketzir) does not just mean the harvest of anything, but specifically refers to grain. Hence the verse explicitly says that Leket applies only to grain and not to anything else. The verse repeats the word “field” twice, even though the second time seems to be superfluous. The Torah could have easily written “When you will harvest your harvest in your field and you will forget a sheave …” without saying again “in the field”. From this extra wording the Yerushalmi implies that the law of Shikcha applies not only to sheaves, but also to standing crops. In other words, whatever is forgotten in the field is considered to be Shikcha, whether it is sheaves or just standing crops. Since by forgotten sheaves there is a clearly defined upper limit of three sheaves that the owner is allowed to go back and take for himself, it makes sense that there should be an upper limit for the amount of forgotten standing stalks above which the owner should be allowed to go back and cut them off for himself. However, there is no clear definition of what that maximum amount is. Mishna Peah 6:7 seems to imply that the upper limit for Shikcha of standing stalks is two Seahs. Seah is a measure of volume, equal to 6 Kavs. Since one Kav is equal to roughly 0.5 gallons, 6 Kavs roughly equal to 3 gallons. Therefore 2 Seahs is approximately 6 gallons (22.7 liters). The reason for this upper limit is explained in the Sifri (ibid.) and Talmud Yerushalmi (Peah 6:5, Daf 30a). The Torah says by Shikcha (Devarim 24:19), לֹא תָשׁוּב לְקַחְתּוֹ, “you should not go back to take it”, implying that Shikcha needs to be able to be carried away by one person and the amount of 2 Seahs is simply too big for that. Although this reason is stated by the upper limit of the size of an individual sheave to which Shikcha applies, it seems to be the same for the standing crops, the idea being that if the poor person would cut them off he needs to be able to carry them away in one shot. It is not clear from the Mishna how to measure this volume of standing stalks. Should it be measured before the grain is cut, which would be a much smaller amount or should it be measured after the grain is cut and bundled, which would results in a much larger amount since the in a sheave the stalks are pressed together? This issue is up for discussion. The Rambam (Commentary on Mishna Peah 6:7) seems to imply that this measurement of two Seahs applies to stalks after they are cut off and piled and not while they are standing. However, this is a difficult opinion to accept, because the owner needs to decide whether to leave these stalks standing as Shikcha or cut them off for himself and he needs to measure them while they are still attached to the ground and not after they are cut off and piled. The Torah explicitly states that Peah applies to grain as implied by the word קְצִיר, “harvest”, as I already explained in note 6. See Vayikra 19:9 and 23:22. כִּי תַחְבֹּט זֵיתְךָ, לֹא תְפַאֵר אַחֲרֶיךָ, לַגֵּר לַיָּתוֹם וְלָאַלְמָנָה, יִהְיֶה. When you beat your olive tree, do not remove all of its beauty after yourself; it should remain for the convert, the orphan, and the widow. It is obvious from the verse that it is referring to the fact that the farmer should not beat the olive tree down to the last olive, but rather should leave some olives on the tree for the poor people to take. However, the expression “do not remove all of its beauty after yourself” is vague and it is not clear to which type of a gift to the poor it is referring to, Peah, Shikcha or something else. Talmud Bavli (Chulin 131b) states that the word אַחֲרֶיךָ (Acharecha), “after yourself”, is referring specifically to Shikcha, but it does not explain why. This is difficult to understand, because the expression “after yourself” does not imply to be something that the farmer forgot by accident, but rather that the farmer should leave some olives on the tree for the poor on purpose which sounds more like Peah than Shikcha. A possible resolution to this question is proposed by the Malbim in his commentary on the Torah (Devarim 24:20) that the Gemara feels that the word Acharecha is extra and was not needed to be said. The preceding expression of the verse, לֹא תְפַאֵר (Lo Tefaer), “do not remove all of its beauty” refers to something that the farmer should leave on purpose, namely Peah, and the following expression, אַחֲרֶיךָ (Acharecha), “after yourself”, is coming to add that the farmer should also leave something that he forgot by accident, namely Shikcha. This derivation is so farfetched that even not all of the Tannaim agreed to it. Mishna Peah 7:1 quotes the opinion of Rebbi Yossi who says that the law of Shikcha does not apply to olives at all. Talmud Yerushalmi (Peah 7:1, Daf 31b) concludes that Rebbi Yossi does not hold of this derivation from the word Acharecha. Our Tosefta however, as well as the opinion of the Tanna Kama in Mishna Peah 7:1, follow the view of Rebbi Akiva who holds of the derivation from the word Acharecha. It is not clear where this derivation is quoted in the name of Rebbi Akiva. To confuse the matter further the Sifri (Devarim 284) states that both laws of Shikcha and Peah by olives are derived from the word Acharecha and not from the two separate parts of the verse as was suggested by the Malbim. Talmud Yerushalmi (Peah 1:4, Daf 7b) provides an alternative source that all fruit trees are obligated in Peah. It derives it from the word שָׂדְךָ (Sadcha), “your field”, in the main verse regarding Peah (Vayikra 19:9 and 23:22). It is not clear how this word implies a reference to trees. It is possible that it generally includes everything that can possibly grow in a field including trees. The other obvious issue with this derivation is that the verse is specifically talking about olives and not any other kind of fruit. However, the Gemara uses it to refer to Shikcha and Peah of all fruit trees. How it arrives at that conclusion is not clear. Due to this problem the Rash Mishantz in his commentary on the Mishna (Mishna Peah 1:4, Vehatvua) writes that by Torah law Peah applies only to grain, grapes and olives, all of which have explicit verses to back it up, however, other fruit trees are only obligated in Peah by a Rabbinical decree. According to that explanation this Tosefta is stating both Torah and Rabbinical obligations in Peah and Shikcha. The Rash rejects all of the derivations from verses quoted in various sources that I already mentioned as mere Asmachtot (references from verses in Tanach for Rabbinical decrees) and not true Derashot (deravations). On the other hand, the Rambam implies in his Mishneh Torah (Hilchot Matnot Aniyim 1:6, 1:7 and 1:14) that trees are obligated in Shikcha and Peah by Torah law and all of the above mentioned Derashot are real and not just Asmachtot, since the Rambam quotes verses as the source for the stated laws and then concludes that all of them are of Torah origin. For a discussion of this argument between the Rash and Rambam see the commentary on Talmud Yerushalmi, Mareh Hapanim (Peah 1:4, Daf 8a, Yomar Zayit). The Tosefta uses the term “the poorest of the Jews” in order to emphasize that even a person who may not be respected in society and does not wield much power, still has his rights upheld and can demand the gifts to the poor to be given to him. I have quoted the text as it appears in the Erfurt manuscript, which has the word מוציא (Motzi), “he takes out”, referring to the poor person who can take the produce away from the owner. However, in the Vienna manuscript the reading is מוציאין (Motziin), “we take out”, referring to the big we, meaning the Bet Din (court). According to that reading the explanation of the Tosefta would be different than the way I explained it in the main text. It would be referring to a poor person who is the owner of the field himself and he wants to keep the gifts to the poor for himself. This is the way Saul Lieberman explains this reading in the Tosefta in Tosefta Kifshuta based on the explanation of a similar Beraita in Talmud Bavli (Chulin 131b). I have chosen the reading of the Erfurt manuscript, because it does not require this explanation, since it is really farfetched to say that there is a poor person who would want the gifts for himself who at the same time owns a whole field, or even some produce. If he has his own produce he should not need the gifts to the poor. The farmer is not allowed to set aside the produce from any of the gifts to the poor for a specific poor person, because that would be favoritism. He must give these gifts to the first poor person who asks for them. Obviously, when the Tosefta says that the poor person can come and take what is rightfully his it does not mean that the poor person can come and take Peah without the permission of the owner of the field, because it was already mentioned earlier in Tosefta Peah 2:7 that the poor person is not allowed to take it until he verifies that the owner set it aside for Peah. All the Tosefta means is that the owner is not allowed to deny the poor person the set aside gifts, because the owner wants to give them to someone else, but rather he must give them to the first poor person who asks for them. However, if the poor person asks the owner if this produce is set aside for Peah and the owner says yes, but he is holding it for a specific poor person, then the poor person who showed up first is allowed to take it anyway despite the owner protesting. The Sifra takes the following words out of this verse and reads them a single flowing text without a comma in between: לֹא תְלַקֵּט לֶעָנִי, which if translated as a stand-alone text would mean “do not rip off the poor person”. The Sifra interprets this to mean that the owner should not help one poor person at the expense of other poor people. I would like to suggest that this Derasha (derivation) is merely an Asmachta (a reference from the Tanach for a Rabbinical law) and not a true derivation of a Torah law, because the verse is completely read out of context. According to the Sifra the law itself was a Rabbinical enactment in order to make sure that all poor people will have equal rights to get the gifts to the poor without the owners of fields holding the set aside produce for their friends. Talmud Bavli (Chulin 131b) states that the reason for this law is because the Torah says (Vayikra 19:9-10 and 23:22) by all gifts to the poor the expression of עזיבה (Aziva), “forsaking” or “leaving”. This implies that the owner should leave the produce for the poor and not have any say in what happens to it after he set it aside for them. Therefore the owner should not be able to somehow put a hold on the gifts and reserve them for a specific poor person. This explanation is a direct derivation of the Torah verses and not and Asmachta, and therefore according to the Talmud Bavli this law is a Torah law, and not a Rabbinical law. As I will explain below in note 15 it seems to me that the Tosefta holds that this law is a Rabbinical enactment and not a Torah law. For an explanation of what Maaser Ani was, see above Tosefta Peah 1:6, note 7. It is not clear why the Tosefta adds the word “underneath” in this case. It does not seem to have any significance. The reason why favoritism does not apply to Maaser Ani just like it does not apply to Leket, Shikcha and Peah depends on the source of this law, as I explained above in note 12. If this is a Rabbinical enactment then we can easily understand that the Rabbis enacted it as a protection against favoritism in the same way as they did by the other gifts to the poor, so that all poor people will have equal rights in accessing these gifts. However, if it is a Torah law then it becomes much more difficult to understand why it is so. By Maaser Ani the Torah does not use the expression of עזיבה (Aziva), “forsaking” or “leaving”. Rather the Torah uses two different expressions, one of הנחה (Hanacha), “putting down” (see Devarim 14:28-29), meaning the owner should put it down so that the poor can come and take it themselves, and also the expression of נתינה (Netina), “giving” (see Devarim 26:12), meaning that the owner should give this tithe to the poor. Neither expression implies that once the owner puts it down he does not have any say anymore to whom it should go. In fact, Talmud Bavli (Chulin 131b) quotes a Beraita that says the exact opposite of the law of our Tosefta, that favoritism applies to Maaser Ani and the owner can hold it for a poor person of his choice, due to this precise reason that the Torah uses the expression of “giving” by Maaser Ani, meaning that he can give it to whomever he wants to. Due to this I am further inclined to say that our Tosefta holds that the law of non-applicability of favoritism to all gifts to the poor is a Rabbinical enactment. The question of applicability of favoritism to Maaserot (tithes) in general, and to Maaser Ani in particular, is discussed in Talmud Yerushalmi (Nedarim 11:3, Daf 37b). There two Amoraim argue about it and bring various proofs to their opinions from verses in the Torah. It is clear from their argument that this law has not been settled for a while after the Tosefta has been completed. 1) Terumah (heave offering). For an explanation of what Terumah is, see above Tosefta Peah 1:6, note 7. 2) Terumat Maaser (heave offering of the tithe). For an explanation of what Terumat Maaser is, see above Tosefta Peah 1:6, note 7. 3) Chalah (dough offering). The Torah commands that every time a person bakes bread he has to separate a portion of his dough to give to the Kohen. See Bemidbar 15:17-21. 4) Reishit Hagez (first sheared wool). The Torah commands that the first portion of wool sheared of every sheep by the herder has to be given to the Kohen. See Devarim 18:4. 5) Zeroah (foreleg), Lechayayim (cheeks), and Hakevah (stomach), known together as the Matanot (gifts). The Torah commands that every time a person slaughters an animal for food he has to give the foreleg (front leg), the cheeks, and the stomach, in particular the last of four stomachs of a ruminating animal, such as a cow, a sheep or a goat, known as the abomasum, to the Kohen. See Devarim 18:3. I will explain each of these gifts in more details below. 6) Pidyon Haben (redemption of the firstborn son). The Torah commands that the father has to redeem his firstborn son from the Kohen, by giving the Kohen five silver shekels. See Shemot 13:13 and Bemidbar 15:18. 7) Pidyon Peter Chamor (redemption of the firstborn donkey). The Torah commands that the owner of a firstborn donkey has to redeem this donkey from the Kohen by giving the Kohen a sheep in order to be able to use the donkey. See Shemot 13:13 and Bemidbar 15:18. 8) Charamim (taboo properties). The Torah commands that anything that a person declares to be a Cherem (taboo property) without specifying that it should belong to the Temple (Bedek Habait) then it automatically belongs to the Kohanim. See Bemidbar 18:14 and Mishna Arachin 8:6. Talmud Bavli (Arachin 28b) states that the owner has to give it to any Kohen who is on duty in the Temple that week, but not to any other Kohen. It is not clear if this Tosefta agrees to that or not. 9) Sadeh Achuzah (inherited field). The Torah commands that a person who inherited a field from his relatives and then consecrated it to the Temple and did not redeem it before Yovel (Jubilee year), and then the field got redeemed from consecrated property by one of his relatives and remained in their possession when the Yovel began then on the Yovel this field automatically goes out from the possession of the relative who owns it and becomes the property of the Kohanim. See Vayikra 27:16-21. This specific gift is not given to the Kohanim by the owner, but rather reverts to them automatically. Since the owner cannot chose which Kohen to give it to it automatically belongs to all of the Kohanim who are on duty in the Bet Hamikdash (Temple) during the first week of the Yovel and they can divide it equally between themselves or can keep it as partners. See Talmud Bavli (Arachin 28b). 10) Gezel Hager (property stolen from a convert). The Torah commands that if property was stolen from a convert who does not have any Jewish relatives at all and the convert died before the thief was able to return him his stolen object, then the thief has to return the stolen property to the Kohanim. See Bemidbar 5:8 and Tosefta Bava Kama 10:9. Since the owner of the property is already dead this gift is given to the Kohen by the thief. Talmud Bavli (Arachin 28b) states that the owner has to give it to any Kohen who is on duty in the Temple that week, but not to any other Kohen. It is not clear if this Tosefta agrees to that or not. Our Tosefta is referring to all gifts mentioned on this list except for number 9, Sadeh Achuzah, and also possibly except for number 8, Charamim, and number 10, Gezel Hager, as I already explained. The Torah gave the Leviim only one gift and that is Maaser Rishon (first tithe). See Bemidbar 18:21-24. For an explanation of what Maaser Rishon is, see above Tosefta Peah 1:6, note 7. See above, note 16, gift number 5. The Torah says (Devarim 18:3) that the לחיים (Lechayayim), literally “cheeks”, of each slaughtered animal have to be given to the Kohen. Since the Torah says “cheeks” in plural, both cheeks have to be given to the Kohen. Mishna Chulin 10:4 and Tosefta Chulin 9:3 explain that it does not just include the cheeks but rather both lower jaws and even a part of the neck of the animal. The exact boundaries of these “jaws” are disputed between the Mishna and the Tosefta. The Hebrew word for “jaw” is לסת (Leset), which is a contraction of its original spelling לעסת, which is in turn derived from the root לעס, which means “chew”. So the word Leset literally means a part of the body with which one chews. Since both the jaws and the cheeks move during chewing it would make sense that the word Leset could refer to either one of them. Unfortunately that word is not mentioned in the Tanach, so we do not really have any reference for its early usage. In the language of the Talmudic literature the precise difference between the words Lechi and Leset was not clearly defined and the words were used interchangeably, sometimes referring to the cheek and sometimes referring to the jaw. For various uses of these words throughout the Talmudic literature see Marcus Jastrow, “Dictionary of the Targumim, Talmud Bavli, Yerushalmi and Midrashic Literature”, 2nd Edition, 1926, p. 702, entry לחי and p. 713, entry לסת. See above, note 16, gift number 5. The Torah says (Devarim 18:3) that the קבה (Keiva), literally “stomach”, of each slaughtered animal have to be given to the Kohen. 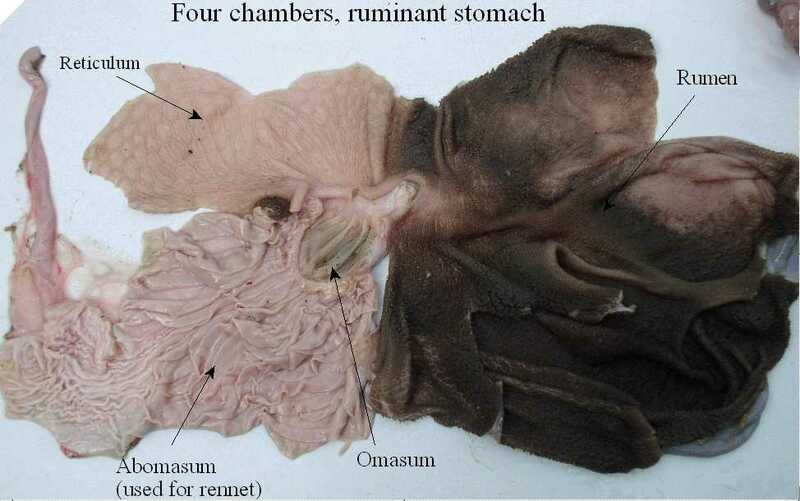 However, ruminants (animals that chew their cud) have a very complex stomach, which is divided into 4 different chambers: rumen, reticulum, omasum, and abomasum. In the first two chambers, the rumen and the reticulum, the food is mixed with saliva and separates into layers of solid and liquid material. Solids clump together to form the cud. The cud is then regurgitated, chewed slowly to completely mix it with saliva and to break down the particle size. Even though the rumen and reticulum have different names they represent the same functional space as digesta can move back and forth between them. Together these chambers are called the reticulorumen. 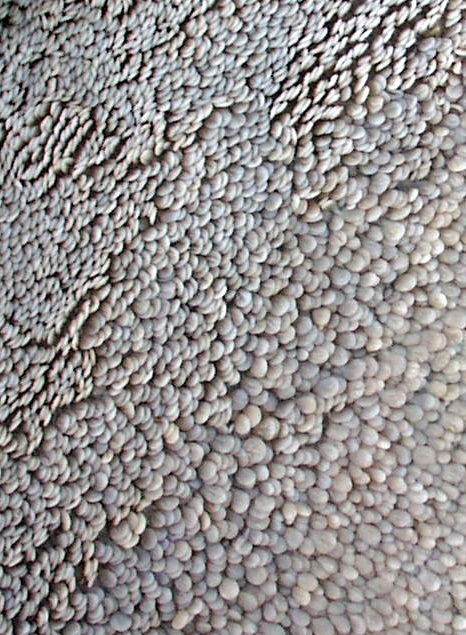 The degraded digesta, which is now in the lower liquid part of the reticulorumen, then passes into the next chamber, the omasum, where water and many of the inorganic mineral elements are absorbed into the blood stream. After this the digesta is moved to the abomasum. 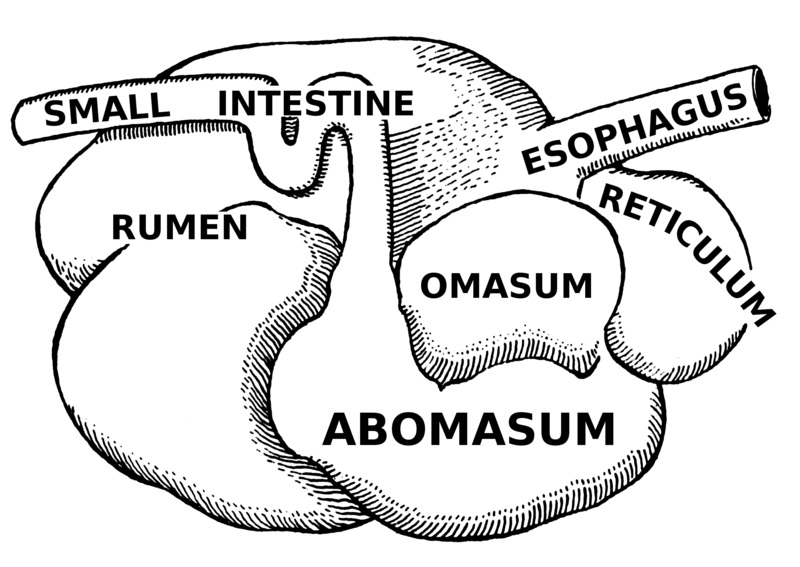 The abomasum is the direct equivalent of the monogastric stomach, such as a human stomach, and digesta is digested here in much the same way. Digesta is finally moved out of the stomach and into the small intestine, where the digestion and absorption of nutrients occurs. The Hebrew word Keiva, although when used in reference to humans refers to the stomach, in ruminants it refers to the abomasum, which is the last chamber of the ruminant’s stomach and is equivalent to the human stomach. This usage of the word was apparently very well defined, because when the Tosefta (Chulin 9:3) explains what it is all it says is that “Keiva is meant literally”. The four stomachs of a suckling kid (goat). Photo: Dr. David B. Fankhauser of University of Cincinnati Clermont College. Rumen – כרס (Keres). The word כרס was originally spelled כרש (see Yirmiyahu 51:34). It seems to have the connotation of not just a stomach, but a place which gets stuffed with food. The word Keres was used to refer to the rumen which is the stomach in which the animals stuffs its food right after swallowing. Reticulum – בית הכוסות (Beit Hakosot). Beit Hakosot literally means “the house of cups”. 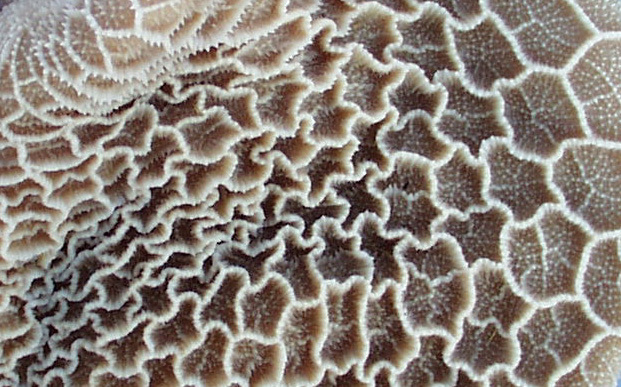 The reticulum is called so because its inner lining looks like cups. Omasum – מסוס (Masos) or מסס (Masas). The omasum is called Masos from the root מס (Mas) or מסס (Masas), which means “to melt”. I would like to suggest that the reason it is called that is because that is where the water is absorbed from the cud into the blood stream. Since melting of ice looks like water is leaking away from it, it is as if the cud melts away in the omasum by losing its water content. The way that the ancients knew that is probably by inspection of the food that was found inside a slaughtered animal. They noticed that the food that was inside the abomasum was completely dry, where as the food inside the omasum still had some wetness to it. Abomasum – קיבה (Keiva). This word is spelled in the Torah (Devarim 18:3) קבה and seems to come from the root קב (Kav) or קבב (Kavav) which mean “hollow”. The abomasum is probably called Keiva because it was commonly inflated like a balloon and then dried in order to be eaten or turned into rennet in order to make cheese. Since people used it in a way that it had a large hollow space inside it was called Keiva (i.e. an object with hollow space inside). It should be noted that the rumen can be inflated as well, but it probably was not as common to do so and therefore this name was not applied to the rumen. Inner lining of the rumen. Photo: Dr. Mohammed Khalil of Purdue University’s College of Veterinary Medicine. Inner lining of the reticulum. Note it looks like cups. Photo: Dr. Mohammed Khalil of Purdue University’s College of Veterinary Medicine. Inner lining of the omasum. Photo: Dr. Mohammed Khalil of Purdue University’s College of Veterinary Medicine. Inner lining of the abomasum. 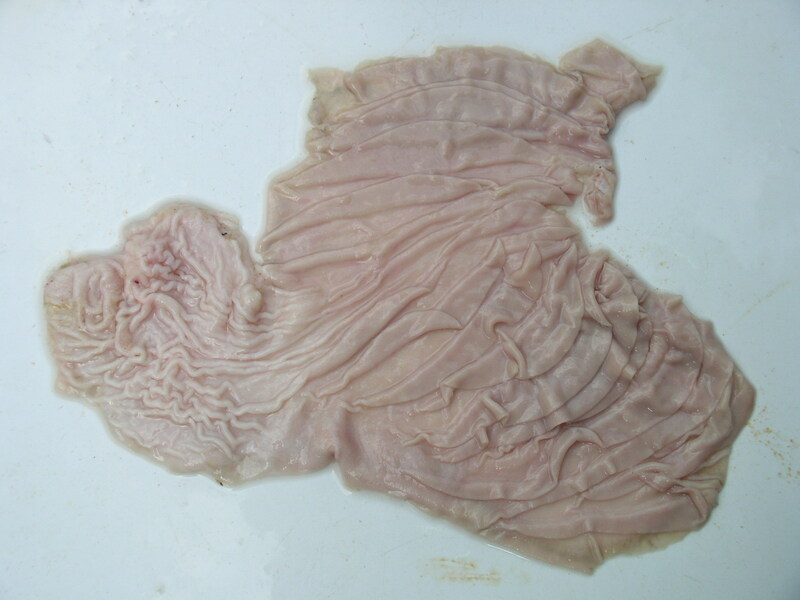 Note the folds (plica) in its inner wall. Photo: Dr. David B. Fankhauser of University of Cincinnati Clermont College. The Tosefta mentioned a gift to the Levi, but did not list what it is in its list of examples, so therefore I have added it (Maaser Rishon) to the list for clarity. As was already implied earlier in note 16 this list of examples that the Tosefta mentions is not exhaustive and there are other gifts to the Kohanim to which favoritism applies, allowing the owner to select the Kohen to whom to give the gifts to. The reason that favoritism applies to the gifts to the Kohanim and the Leviim is the same as was mentioned in note 15. The Torah always uses the expression of נתינה (Netina), “giving” in various verses that discuss these gifts. The expression of giving implies that the owner can give the gifts to whichever Kohen or Levi he chooses and does not have to give it to anyone who comes to demand them. בַּעַל הַבַּיִת שֶׁנָּתַן פֵּאָה לַעֲנִיִּים אֵין רַשַּׁיי שֶׁיֹּאמַר לָהֶן טְלוּ זֶרַע וּתְנוּ פִשְׁתָּן טְלוּ תְמָרִים וּתְנוּ מִכְבָּדוֹת. נָשְׁרוּ וְאַחַר כָּך הִפְרִישָׁן אֵין חַיָּיב משּׁוּם פֵּאָה אֶלָּא זֶרַע בִּלְבָד. 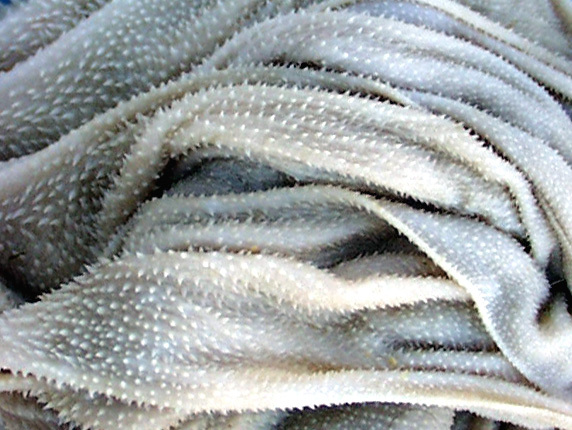 The Tosefta teaches that the obligation of leaving Peah includes in itself not only the edible part of the plant, but the whole stalk or branch. 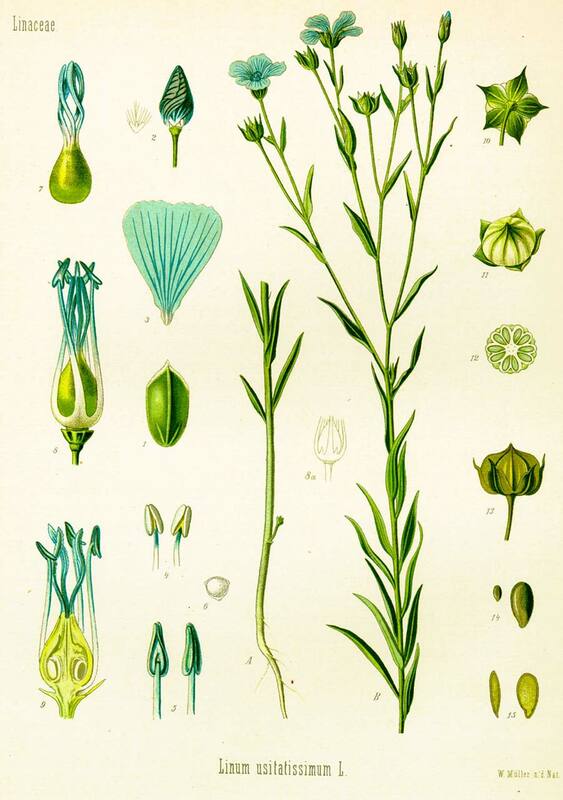 So in the example of the Tosefta, if the crop that is being given as Peah is flax, the owner cannot say to the poor people that they should just take the kernels of the flaxseed, because that is the only edible part of the plant and they should give him back the flax stalks themselves, so he can extract fibers from it and make linen, but rather everything belongs to the poor, both the seed kernels and the stalks. In the case of fruit growing on a tree, not only the fruit belongs to the poor, but also the branches of the tree on which the fruit grows. This law is learned out in the Sifra (Kedoshim, Parshitta 1, Perek 3) from the verse in the Torah (Vayikra 19:9-10 and 23:22) that says תַּעֲזֹב (Taazov), “leave” it to the poor people, implying that it should be left in the exact way that it grows, attached to the stalk or to the branch, with the branches included in the gift. 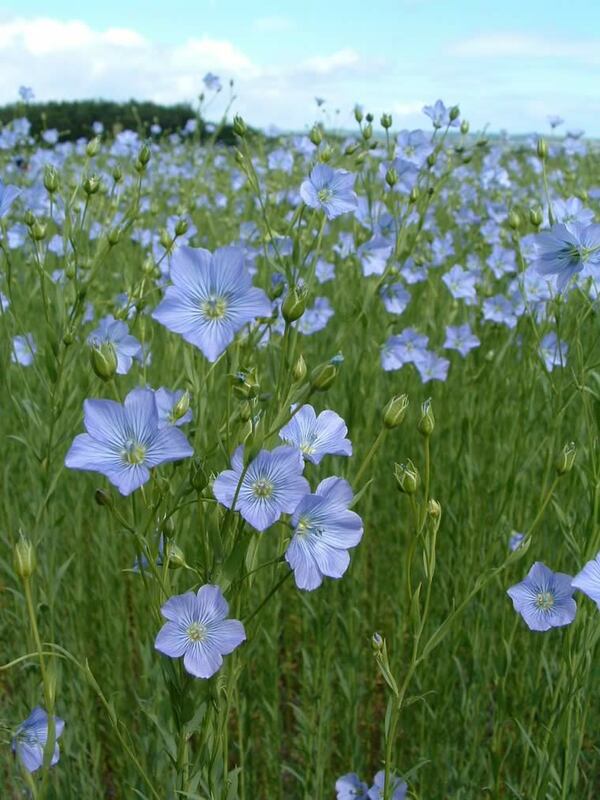 Common Flax (Linum usitatissimum). Notice the box with seeds that forms underneath the flowers. The fibers that are used to make linen are extracted from the long stem of the plant. The Hebrew word מכבדת(Mechabedet) (plural: מכבדות, Mechabdot) literally means a “broom”. 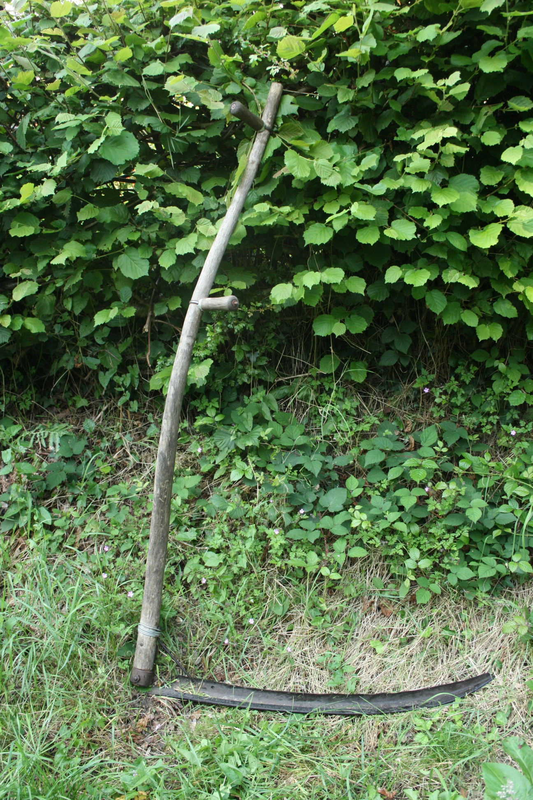 A palm branch that is fully open was called a Mechabedet, because it was commonly used as a broom to sweep the house. 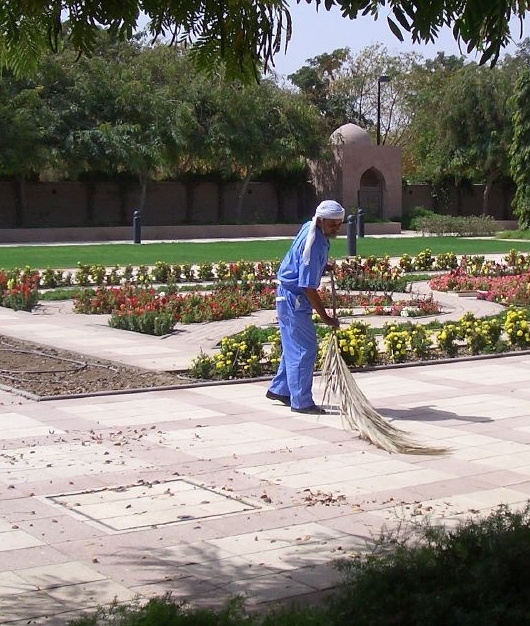 A man sweeping the street with a date palm branch in Oman. Photo: rmtw’s photostream. It does not matter why the fruit fell off the branch. It could be due to wind blowing it off or the fruit got simply too ripe and fell off by itself. The Tosefta teaches that the branches only belong to the poor as a part of the gift Peah if the fruit was separated while it was still attached to the branch. However, if it was separated after it was already detached from the branch, then the branches do not need to be separated for Peah and still belong to the owner. The Sifra learns this law from the same verses in the Torah (Vayikra 19:9-10 and 23:22) as the previous law, from the word אֹתָם (Otam), “them”, meaning that the farmer only needs to leave “them” (i.e. the seeds or the fruit), but not the branches, in the case where they already got separated. The Sifra clarifies, as our Tosefta implies, that if the owner cut off the branches with the fruit on it from the tree for Peah, and then before the poor people took them, the fruit got detached from these branches, the branches still belong to the poor people and not to the owner. This is because since they were already separated from the tree with the intent to be given as Peah, they belong to the poor from that moment on, regardless of the fruit that is attached to them.